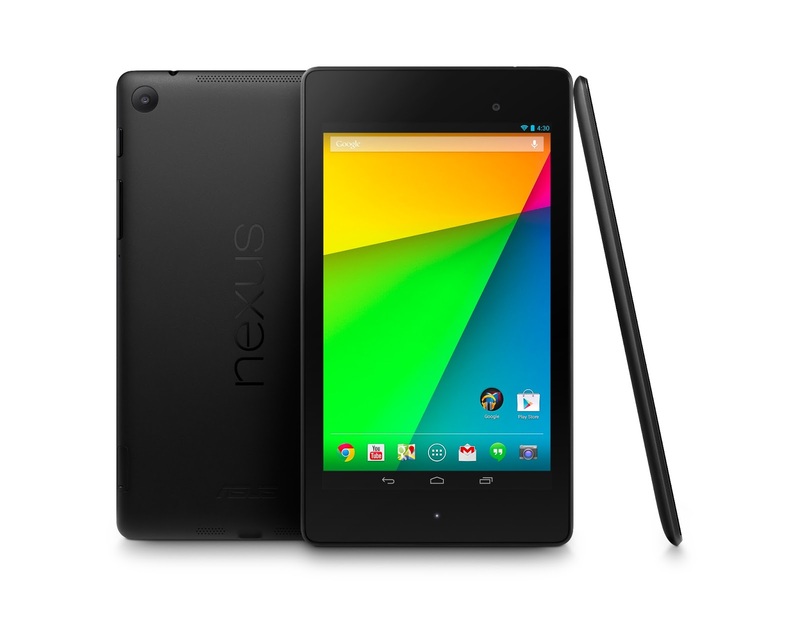 GearPop › The NEW Nexus 7 (2013) or the NEW iPad Mini with Retina Display? Google recently updated the Nexus 7 for 2013, bringing some much needed spec. increases to help the tablet better compete with the other new tablets coming out this year and next year. One of these, is the NEW iPad Mini with Retina Display. These two tablets seem pretty comparable, so which is the best one for you? The Nexus 7 has a 1.5GHz Qualcomm Snapdragon S4 Pro CPU clocked at 1.5GHz, with 2GB of RAM. Whereas, the iPad Mini has an Apple A7 chip with the RAM still unconfirmed (we suspect 1GB). These processors are pretty comparable and it is fair to say, that technically, they should perform very similarly in benchmarks. However, benchmarks are not the full story, it is how the devices will perform whilst playing games, surfing the web, etc. that matters. Let us assume that the iPad Mini has the 1GB of RAM it is speculated to have, this means that the Nexus 7 should be able to run more apps simultaneously without slowing down, than the iPad Mini. However, this may not actually be the case, as, iOS is well optimised to handle multiple apps very well, even on older devices with small amounts of RAM (such as the iPhone 4S for example). The two devices have fairly similar displays: the iPad Mini has a 7.9 inch, 2048 x 1536 display, with a pixel density of 326 pixels per inch (ppi), compared to the Nexus 7’s 7 inch, 1920 x 1080 display, with a ppi of 323. It is clear then, that the Nexus 7 should be slightly easier to handle, due to its slightly smaller screen size, but in practice, this will make little difference. The resolution on the iPad is higher too, so text and images will be rendered slightly more sharply on this device. The Nexus 7 is slightly lighter than the iPad Mini, coming in at 290g )or 299g for the 4G model), compared to the iPad’s 331g (or 341g for the 4G model). This will, again, make the Nexus 7 slightly easier to hold for longer periods of time. The Nexus 7, however, is over a millimeter thicker than the iPad, coming in at 8.65mm, compared to the iPad Mini’s 7.5mm. As we have seen, the devices are pretty comparable, at least on paper. Therefore, the defining feature that is going to make you sway either way is going to be which operating system you prefer: either Android 4.3 ‘Jellybean’ (soon to be 4.4 ‘KitKat’) or iOS 7 (currently iOS 7.0.3 at the time this is published). It is clear that both OSs work very differently. iOS is more simplistic, but arguably easier to use for somebody who is new to tablets in general, whereas Android is far more customisable. If you don’t like something you can change it. You don’t get nearly as much customisablity on iOS. However, iOS is clearly ahead on optimised tablet apps. Although Android is catching up, it is still far behind iOS. So on balance, which is the better device? It really depends on whether you prefer more customisation and fewer optimised apps, or vice versa, The hardware is pretty comparable, so I don’t think that in itself should sway you either way. At the end of the day, it’ll be whether you prefer iOS or Android. What do you think? Have I missed something? Let me know what you think in the comments! I would prefer iOS, I do have the old Nexus 7 and there is a lot of customization you can do with Android. I’ve never used an iPad/Mini but i have dabbled around with iPods & iPhones and with that, the “I” experience was amazing! I think i will sale my Nexus 7, get the new Nexus 7 and also purchase an iPad mini 2. I think if you really want to appreciate “tech” you need to look at it from both sides. I choose both they both sound like kickass devices! Think you should mention the price, over here in the UK the Nexus 7 32GB Cellular is £299, an iPad mini RD with the same config is £499 which is a huge difference. I would personally go for an iPad Mini w/retina display because it integrates better with my ecosystem. How ever the Nexus 7 is a really good device at an incredible price point and wouldn’t be a bad compromise!